Fishing Reports, hunting & outdoor activities, news & social network. Despite its ‘advanced’ connotation, the dropshot rig couldn’t be simpler. Think split-shot rig in reverse. As a softbait delivery method, the dropshot excels for bass. So it’s no surprise that small baits twitched and wiggled in new and tantalizing ways hold equal appeal for crappies, sunfish and big perch. If you can cast, you’re in. If you can tie a Palomar knot, you can master a dropshot rig. Amazing that such a versatile rig— this prefect presenter of soft plastics and livebait— would be so little employed by panfish fans. In reality, a dropshot rig can be as productive as a bobber and bait, or even a tiny jig. It’s even possible that the dropshot is the most versatile rig of all; providing instant depth control, fishes heavy without impairing or impeding the presentation, shines in shallow and deep water, and activates softbaits like no other presentation. Tons of small softbaits now give panfish anglers an arsenal of sweet options. Yet, while shapes like twister tail grubs excel on a jig, a dropshot activates straight tail worms, minnows and other subtle shapes. Moreover, many classic softbait shapes traditionally threaded onto 1/8 to 1/64-ounce jigheads spring to new life when pinned to a plain hook above a sinker. Consider the Wedgee, a lively microbait ‘twitcher’ that marries perfectly with a dropshot. Impaled onto a #10 or #12 short-shank hook above a dropshot sinker, the Wedgee and other wispy sliver-tail baits can be almost magic for palm-stretching pans. Deployed with a ¼- to 3/8-ounce weight, these tiny morsels move with spellbinding action. Other microbaits like Finesse Plastics and Noodel and Northland Tackle’s Impulse Bro Bloodworm perform truly captivating dropshot dances. Anything with nice soft appendages and a fine quivering tail is a potentially perfect dropshot enticement. So long as you can nose hook it on a #6 to a #12 fine-wire hook, such as an Eagle Claw L2B, nearly any miniature morsel can be made to tempt bites, including livebait. As with any presentation, of course, limitations exist. Shallow dense cover areas, such as thick vegetation or brush are largely off limits. Fish suspended higher than three feet above bottom are also better served with other approaches. But even this situation has exceptions. When crappies or sunfish suspend in treetops or sparse brush deep enough to fish vertically beneath your boat, a dropshot can be the perfect presentation. Based on countless cover, depth and other conditions, a well-armed dropshot can be built with an array of possible componentry. 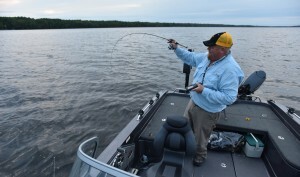 “To detect bites,” says Bro, “I use a 4- to 8-pound test braided mainline, joining it to an 18- to 36-inch section of mono or fluorocarbon, using back-to-back Uni knots or an Improved Albright knot.” Often, when hunting fish within a foot of bottom, Bro says, an 18-inch length of 4- to 6- pound test mono is perfect. “Best rig there is for fishing just inches above low growing grass or small rocks, keeping a bait clean and at eye-level with the fish,” Bro asserts. “With a ¼-ounce sinker and 4-pound test, I can even get down to 20 feet of water fast, and fish with finesse and precision. 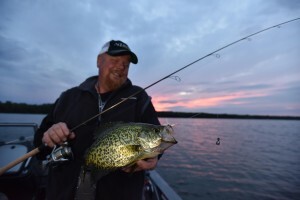 For casting to shallow spring panfish, a dropshot can be powerful medicine. “Fish that have just moved up onto shallow flats aren’t real active yet. I use a 7-foot St. Croix Panfish Series rod to pitch a compact dropshot rig past the fish and slowly work it into position. Once there, give the rod-tip periodic nervous shakes, so the sinker stays put, but the bait’s little tail quivers like a defenseless invertebrate, inches above bottom.